Wits formally introduced eLearning in June 2002, when the University adopted the proprietary WebCT learning management system (LMS). After a comprehensive study, undertaken in 2008, to consider the feasibility of both open source and proprietary alternatives to WebCT, the Senior Executive Team (SET) approved an open source approach to an LMS solution. Following this approval, the University also took the decision not to renew the WebCT license after 2011 and began to explore its options regarding a campus-wide implementation of another open source LMS named Wits-E (SAKAI). However, not all the subjects were on Wits-E, for commerce students only Economics was on Wits-e and other announcements were made on the noticeboard. It was only in 2012 whereby all the subjects were now on Wits-E. The group managed to survey a sample of sixty four (64) students of different year of study and faculties. From the 64 students surveyed, a massive 39 of them (61%) were from the Commerce, Law and management faculty. It was done so as we wished to concentrate mainly on the computer labs found on the eastern campus of the University. The results are as follow. In general, the computer laboratories at Wits are well maintained and resourced. There are some niggling issues that need to be attended to for the laboratories to be more than decent. These issues include the lack of paper in the printers, the lack of computer assistance, not enough computers or the few that are there are not all working and the long log-in time for individual accounts. Some of these issues are harder to rectify than others but they definitely need to be looked at. Suggestions would be that Wits should hire more assistants in the labs to help with computer problems, ensure that those few available computers in the labs are all working properly and also make sure that there is always paper in the printer. 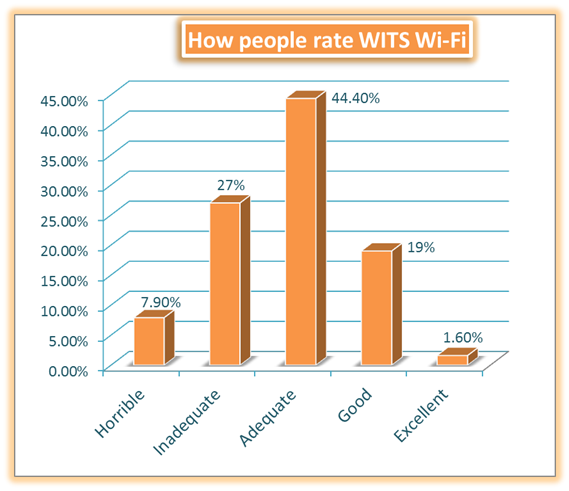 The results show that the Wits Wi-Fi services are good but can still be improved. Almost 80% of the students surveyed find the Wi-Fi to be just adequate or less than adequate. Only 21, 6% think the Wi-Fi is good or excellent, it should also be noted that a higher portion of students find the Wi-Fi more horrible than excellent. The overall response suggests that students are not satisfied and that the Wi-Fi system needs some improvement. A more stable connection and a wider spread connection across the campus rather than just a small number of hotspots would be a start. Question 3 asked about the level of functionality of the Wits-E (Sakai) information system, so we asked this question in order to find out how functional it is to the Wits students and based on the results a majority of the students find it functional and very-user friendly. Question 4: Are online tutorials and training appropriate in a tertiary institution? 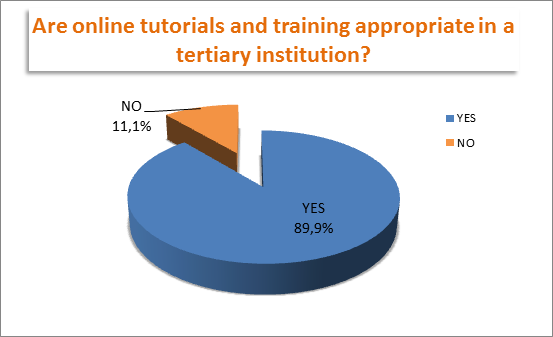 According to the feedback, 88, 9% of the 64 students that participated in our survey, said that online tutorials and training are appropriate in a tertiary institutions. Of the 64 students, only 11, 1% of the surveyed disagreed. The following illustration confirms that online tutorials and training were right to have been implemented at Wits. 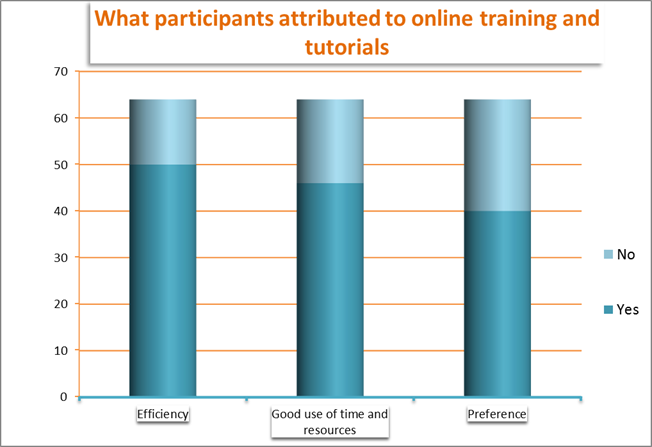 In the greater scheme of things, 86 % (55 of 64) participants agreed to experiencing benefits from online training and tutorials. 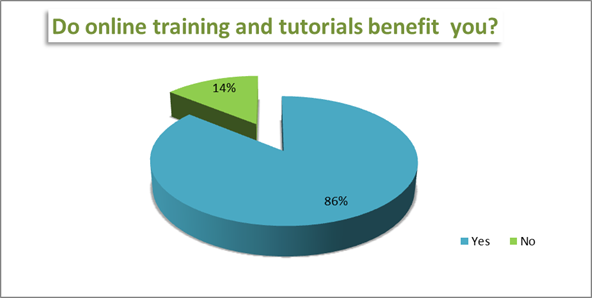 The main benefit and attribute, as voted for by 78% (50 participants), is ‘Efficiency’. The attribute which was least common was ‘Preference’, here being to online assessments being preferred over written assessments, with 37.5% of participants preferring to use written assessments. A possible alternative to improve effectiveness in the use of verbal and visual simulations as online assessments is predominantly text based. Ultimately we see that the general overview of the student population is that online tutorials and training is beneficial to their studies and that they are predominantly willing to participate in such activities. Those, however, who share the alternative stance towards the online implementation of their work, may be attributed to their familiarity to systems run within high schools which are based on written assessment and thus there is difficulty in adapting for these students. The university could regularly, say bi-annually; oversee the improvement of Sakai through resolving the systems bugs and adapting the system to resolve student issues – this so as to make the online experience beneficial and acceptable by all. Furthermore, as we can see that online training and tutorials will play an integral part in the university in years to come, innovative ideas could be implemented to improve the system – this possibly the introduction of verbal and visual simulations.